Culture abounds in the Greek capital, where the legacy of ancient civilisations is in contrast with a visual arts scene that is one of the most talked about in Europe. The ongoing regeneration of Athens has meant improved infrastructure for the incredible archaeological sights and established museums and galleries. It has also nurtured a new generation of creatives, bringing invention and vibrancy to this ancient city. 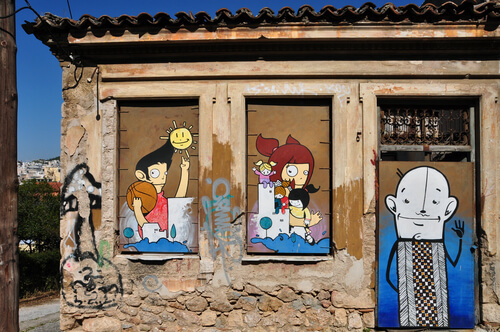 From large-scale murals that cover the side of a building to personalised tags on street signs, benches and dumpsters, Athens is chock full of street art. Much of this open-air gallery is a city-wide opportunity for young artists to make social or political statements. But there is also humour to be found in the art and joy in the colour and life it brings to so many neighbourhoods. Soak up the creative energy along Megalou Alexandrou in Metaxourgio, explore the side streets of Monastiraki and Syntagma and discover walls transformed into canvases in bohemian Exarheia. To see some of the best pieces, take a tour with a local street artist. Proving that this scene has gone well beyond the realms of teenage graffiti, some of Athens’ street artists are now exhibiting their work in commercial spaces, too. Look out for the well-respected Cacao Rocks or Billy Gee, who has exhibited at the city’s Bouziani Museum and Onassis Foundation. In the middle of summer, when daytime temperatures are regularly in the 30s, you’ll probably find yourself seeking evening activities. How about settling down to watch a movie under the stars? The city’s charming open-air cinemas are open from May to October and show current and classic movies in a relaxed atmosphere. Try Cine Paris near the Acropolis or Cine Dexameni near Mount Lycabettus. Movies are not dubbed and usually, have Greek subtitles but do check before booking. 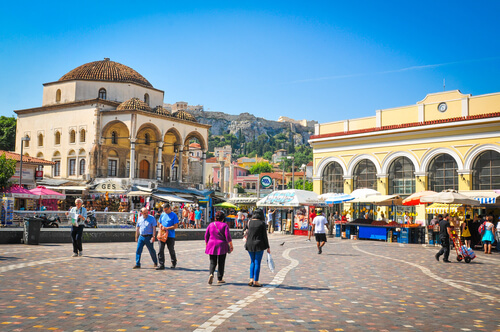 In Athens, a trip on the metro is not just a journey from A to B. It’s an opportunity to soak up ancient history and modern art in some of the most varied and beautiful underground stations in Europe. Acropolis Station is a treasure trove of archaeological finds, filled with pottery and sculptures from the Parthenon. Evangelismos is home to a modernist installation by Greek sculptor Chryssa, while Ambelokipi has a display of dazzling neon by Greek-American artist Stephen Antonakos. A huge glass cabinet in Syntagma Station shows a cross-section of the ancient wall uncovered when the area was excavated. 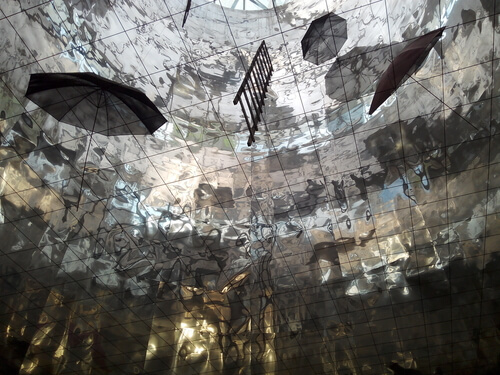 Contemporary sculpture is also on display here with George Zongolopoulos’ installation Atrium – a metallic dome filled with flying umbrellas. Craving more Metro art? Other stations that double as galleries are Egaleo, Monastiraki and Omonia. 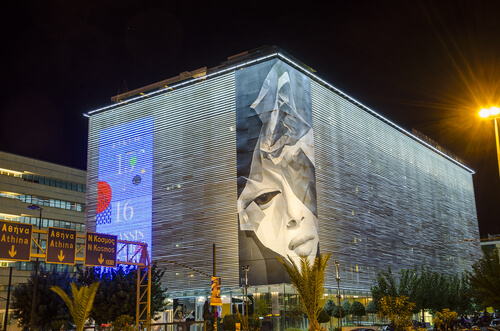 The Stavros Niarchos Foundation Cultural Centre is a multifunctional must-see in the port town of Piraeus, 10km from the city centre. Designed by Renzo Piano this stunning structure is home to the Greek National Opera and the National Library as well as a multitude of education, arts and recreation facilities. Admire the views from the glass-walled Lighthouse, a box floating above the green roof, or take a stroll through the 52-acre park featuring playgrounds and picnic spots. To pack in a lot of culture, head to Vasilissis Sofias Avenue – the so-called ‘museum mile’ that showcases Greek culture through the ages. The permanent galleries at the Museum of Cycladic Art contain over 3,000 pieces of Cycladic, Ancient Greek and Cypriot art as well as exhibitions by contemporary artists such as George Condo and Paul Chan. The Byzantine and Christian Museum is a trove of ecclesiastical art including sacred icons, mosaics, manuscripts and sculpture, all set in beautiful walled gardens. Benaki Museum, a gorgeous neoclassical building near Syntagma Square, houses an eclectic array of art and artefacts that include Greek historical heirlooms, an important collection of Islamic art, and a vast photographic archive. The contemporary art scene is thriving in Athens and the city is full of emerging talent, so it’s a great time to invest in an up-and-coming art market. A handful of commercial galleries are beginning to make an impact on the local and international scene. The Breeder gallery in Metaxourgio has been described as ‘one of Athens’ most exciting cultural platforms’ and showcases the works of new contemporary artists like Sofia Stevi and Alexandros Vasmoulakis. Elsewhere, look out for Aristeidis Lappas and his expansive, colourful paintings, Chrysanthi Koumianaki’s reimagined objects and the geometric paper pattern work of Stratis Tavlaridis – his clever Instagram feed @stratis_tavlaridis is a treat to behold.